Wyndywood Worm Farm is proud to present the Vermihut Worm Farm. Made from 100% recycled plastic and now UV stabilized, the VermiHut Worm Farm is similar to most tiered worm farms on the market, except our design is more pleasurable to the eye and comes in 3 great colors to match your outdoor decor. The VermiHut has a one piece molded leg system which will not collapse under the weight of its contents or when knocked by a passer by, unlike other clip-in leg system models. -Looks great in all backyard designs. -Teachers children the benefits of recycling. -Approx 20% smaller than some household worm farms, meaning less weight per basket, making it easier to handle for our children and older generation. -Smaller unit means quicker turnover of tiers, giving you fresher castings to use. -NOT being black means less outside heat absorption, so you wont cook your worms. -Accommodates up to 3 to 4 kgs of worms. 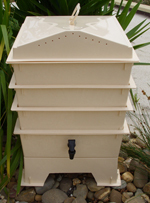 -Holds approx 40 litres of worm castings ( 3 tier). -Great for smaller backyards, courtyards and balconies etc. -Waterproof lid because aeration is positioned on the side of the lid and not on top. Our worm farms are made of recycled plastic and the factory does its upmost best to colormatch our very own colors as best as possible. Unfortunately at times, some of the colors may vary slightly, either darker or lighter or somewhere in between. Virgin material is very easy to colormatch, but using recycled material, it is very challenging because all recycled material batches bought are different colors, unlike virgin plastic, so please be aware that the pictures shown are to show the colors we try our best to achieve, but can vary. UV stabilization assists the plastic so it doesnt become brittle due to UV conditions. It may not prevent fading, but does help. Thanks for your understanding and happy composting. the Vermihut comes with a 2yr warranty on faulty manufacturing.